William Lassell. began constructing the instrument in 1843 and completed it in 1845. The discovery of Neptune in September 1846 was reported in the Times and Lassell, on 10 October 1846, observed the moon around Neptune. This was reported to the Royal Astronomical Society. In 1851, Lassell followed up this success by discovering two moons of the planet Uranus, which he called Ariel and Umbriel. In 1858 he found the eighth moon of Saturn, Hyperion, but later found he had been beaten to the discovery by one day by the American William Cranch Bond. Main mirror: The 24 inches refers to the diameter of the mirror in the instrument. The original mirror, currently on display in Liverpool Museum, was cast in speculum metal, a special alloy of copper and tin. Speculum keeps its polish over a long period. Weight 370 lbs (168 kg). Tube Length: It was an "F10" instrument: the focal length of the mirror was 10 times its diameter. This meant that the main tube was about 20 feet (6.1m) long. Overall dimensions: When the tube was vertical the height of the instrument was about 30 feet. The weight of the instrument itself was about 2 tons. The two stone piers on which the telescope rested brought the total weight up to about 5-6 tons. 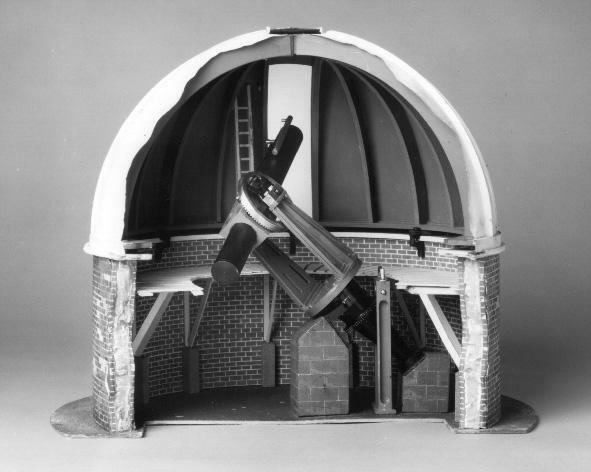 Significance of the telescope design: The 24 inch reflecting telescope was the first of the large reflectors to be mounted "equatorially" to allow easy tracking of the stars. It paved the way for future development in reflector technology, leading to the large equatorial instruments seen in many national observatories around the world. William Lassell's 24 inch reflecting telescope was a revolutionary instrument in telescope design. It was the first of the large reflectors to be mounted equatorially. This allowed an object in the sky, such as a star or planet, to be observed easily over long periods. It paved the way for future developments in reflector technology, which soon led to the large equatorial instruments seen in many national observatories around the world. Lassell used a simple hand-cranking method to turn his telescope, not a clock-drive. The mounting consisted of two axes, polar and declination, at right-angles to each other. The polar axis was aligned with the northern celestial pole, near the North Star. This counteracted the effects of the Earth's rotation and kept the object in the telescope's field of view. Lassell cast the polar axis in two main sections. The lower section was a hollow cone of cast iron weighing about 2000 lbs (910 kg). This was placed between two stone supporting piers with the lower ball end of the cone resting on a hemispherical recess on the lower pier. Two uprights, each 7ft (2.1m) high and 3ft (0.9m) wide at the base, were bolted on to the single cone casting. The telescope tube was about 20ft (6.1m) long, made from 0.1 inch (2.5mm) thick sheet iron and riveted internally for a smooth finish. It was fixed to the rest of the telescope at its centre of gravity by a heavy cast-iron box which was mounted on the polar axis by trunnion bearings. 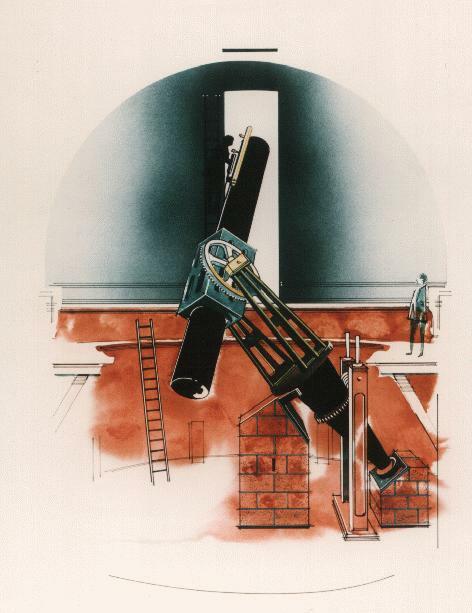 Because the eyepiece was at the Newtonian focus (at the top of the telescope), the tube could be rotated so that the eyepiece was always at a convenient angle for the observer, whatever the angle and position of the tube. Lassell went to Ireland to visit the 3rd Earl of Rosse (himself a wealthy amateur astronomer) for ideas on casting and polishing large speculum mirrors. Lassell had already made a small 9 inch mirror and in 1843 began to make the 24 inch. Speculum metal is an alloy of copper and tin. Other astronomers used a little arsenic but Lassell considered this unnecessary if the original materials were sufficiently pure. The mirror weighed 370 lbs (168 kg); Lassell ground and polished it himself to give a 20 foot (F10) focal length mirror of superb quality. This was mounted in a "skeleton box", a wrought-iron mirror cell that was fastened to the bottom end of the main tube. With help from the foundryman James Nasmyth, Lassell made his own equipment to grind and polish the mirror. This gave a parabolic curve accurate to better than a quarter of the wavelength of light, ideal for observing the planets. The secondary mirror was a 45° angled flat made of speculum and mounted on a single arm support inside the main telescope tube. This directed the beam of light from the main mirror out through the side of the tube to the observer's eyepiece. Lassell often found it better to use a prism instead of the mirror. To prevent the prism dewing over on cold damp nights, Lassell heated up an iron cube, wrapped it in felt and placed it at the back of the prism in a special holder. William Lassell a brief history. William Lassell (1799-1880) and the discovery of Triton, 1846 by Allan Chapman.